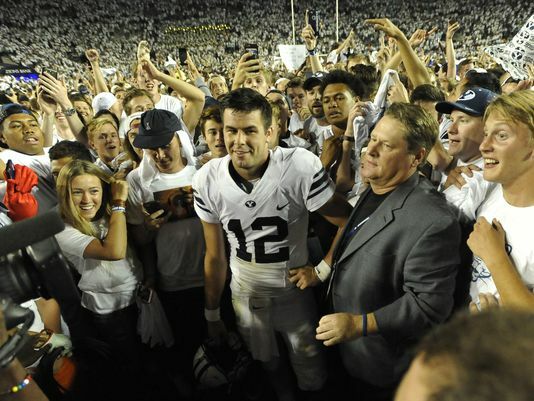 PROVO, Utah — Tanner Mangum bounced into theBrigham Young locker room after his latest miracle with a smile, a laugh and, upon seeing Bronco Mendenhall, an apology. I’m sorry, he said, for making it so close. The growing legend of Tanner Mangum is being written live, for three hours every Saturday, and its most charming aspect is this: He doesn’t know any better than to apologize — with a smile, and a laugh — on the tail end of another miracle. The 11th pass of his college career was a game-winning Hail Mary as time expired to shock Nebraska, a moment already memorialized on shirts for sale outside of Lavell Edwards Stadium. On the third play of his first career start, Mangum rolled far, far to his right, nearly onto the white stripe of the sideline, before tossing a rainbow heave that was lost briefly in the stadium’s bright lights before falling into the arms of wide receiver Mitchell Juergens, who strolled into the end zone for an 84-yard touchdown. This is one amazing young man!!! He is a natural!!! So glad the coach sees his goodness.